Hi friends! Rather than avoiding blogging for another day (like I've done for the last two weeks... yikes!) I thought I would jump in today and check in. I'm just too busy right now. Everything around me is suffering for it. I used to have one of those blogs with good pictures and fun stories. USED to! Ack. I keep thinking about the blogging I should be doing, about the stuff that is just about to happen. The truth is, all of my current projects are on a gag order and I can't share them. But I can tease them, right? 1. Designing a series of patterns based on the Wizard of Oz. I'll be able to show the first one off in June. 2. A little something coming out soon in Spin Off. It's small, but fun. 3. Another little something in an upcoming issue of Knitscene. I'll remind you about this later. I know this is all pretty uninteresting without photos. I'm bored just typing it. 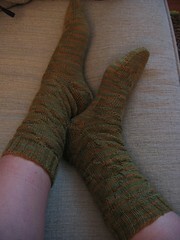 I'll share some terrible pictures of this thing I shouldn't be doing: Sock Madness. Despite working seven days a week, I am sneaking in some competitive speed knitting. I made it through the first three rounds, which is how far I got last year. I hit my goal. I'm happy. Last year I stopped because I moved to Portland... hey! I've lived here one year now! Amazing! Guess that means it's time to move again. Seriously, I'm staying in Portland, but I have to move. Anyone know a bright, clean, cheap, and quiet place to live here? If I can get this sorted I may actually have more time for blogging... right? But spring really is here so my mood should be lifting soon. 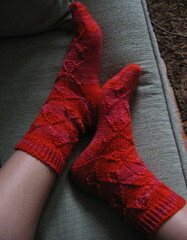 Maybe you haven't been blogging because you've been too busy knitting socks! They are great. I really like the gray and white ones. You must stop designing! I can't keep up with the knitting...teehee. Great socks. And I love the patterns. Just have to decide which yarn to use to knit them! Sock Summit class schedule is up!